A restricted nonlinear (RNL) model, obtained by partitioning the state variables into streamwise-averaged quantities and superimposed perturbations, is used in order to track the exact coherent state in plane channel flow investigated by Toh & Itano (J. Fluid Mech., vol. 481, 2003, pp. 67–76). 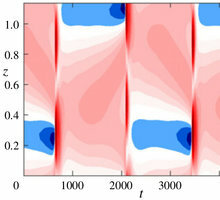 When restricting nonlinearities to quadratic interaction of the fluctuating part into the streamwise-averaged component, it is shown that the coherent structure and its dynamics closely match results from direct numerical simulation (DNS), even if only a single streamwise Fourier mode is retained. In particular, both solutions exhibit long quiescent phases, spanwise shifts and bursting events. It is also shown that the dynamical trajectory passes close to equilibria that exhibit either low- or high-drag states. When statistics are collected at times where the friction velocity peaks, the mean flow and root-mean-square profiles show the essential features of wall turbulence obtained by DNS for the same friction Reynolds number. For low-drag events, the mean flow profiles are related to a universal asymptotic state called maximum drag reduction (Xi & Graham, Phys. Rev. Lett., vol. 108, 2012, 028301). Hence, the intermittent nature of self-sustaining processes in the buffer layer is contained in the dynamics of the RNL model, organized in two exact coherent states plus an asymptotic turbulent-like attractor. We also address how closely turbulent dynamics approaches these equilibria by exploiting a DNS database associated with a larger domain.